In anticipation of the 2017 Great American Solar Eclipse, the SPS National Office announced the Solar Eclipse Grant, encouraging chapters to participate in the solar eclipse and create outreach demonstrations for members of their community. Chapters awarded the grant received SPS-branded solar eclipse safety glasses and access to astronomy-related demonstrations. After the eclipse, chapters submitted reports detailing their events. Three SPS chapters' reports, including Linn-Benton Community College (OR), University of Rochester (NY), and William Jewell College (MO), are featured in this article. 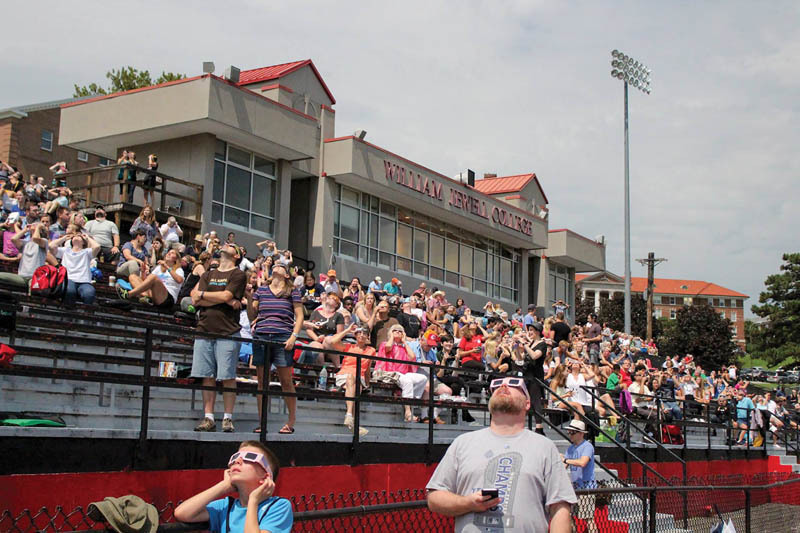 Our Linn-Benton Community College (OR) (LBCC) Eclipse Festival was incredibly successful! Several Society of Physics students such as myself had been looking forward to this spectacular event for more than a year. I talked about the possibilities of opening up our campus to anyone to come stay the night Sunday and share this experience with us Monday morning. The idea got around, and we got approval! Students made this happen, and SPS helped, too. We worked hard and recruited more than 40 volunteers. We had friends, family, faculty, and administration joining in to ensure that this was a successful community outreach event. We were also joined by another college. 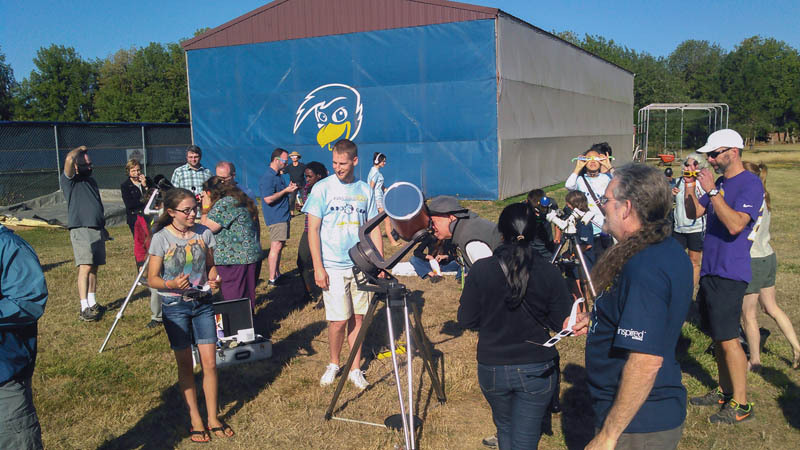 Lane Community College brought more than 10 volunteers, including professional astronomers and meteorologists, to help provide an educational and entertaining atmosphere. We had several attractions, including a large sundial and a scale model of the Sun, Earth, and Moon. There was even free nitrogen ice cream for everyone! Some of our instructors and volunteers put on a show called “The Life and Death of Suns,” which brought about 200 people into our theater. LBCC’s Professor Greg Mulder was the host and did a great job giving the crowd a fun and interactive lecture with some insight on up-to-date science about fusion reactors, energy use, infrared cameras, and the Large Hadron Collider. He really showed us how important science is. There was live music and a firedancer. We then stayed up late into the night watching the stars. We woke up to a nice breakfast at 7:00 a.m. Monday, and after some last-minute safety instructions and passing out a few more solar glasses, the eclipse began. Classes were cancelled, but we had more than 370 people from across the country that came and camped out on our soccer field. We also had an unknown number of people sneak in and camp in the parking lot. Another small parking lot filled up Monday morning, so there were at least 500 people there with us. Most of us made our way out to the campsite where the solar viewing equipment had been set up. The sight was spectacular. When totality hit, the crowd roared, cheered, and blew whistles. I can say that in preparing for that moment I had read at least six different eclipse books (even corresponded with Tyler Nordgren) and every article and piece of history I could find. I searched for months for pictures to put in presentations and to share with friends. I had read poetry, seen art, I even saw a quilt made into an eclipse and—Nothing. Comes. Anywhere. Close. to the sight I saw that morning. I will never forget it. I don’t believe any level of communication or comprehension or understanding could give someone the sense of what it is to see an eclipse with your own eyes. I still get goose bumps (like right now!) when I think or talk about it. My retinas are safe, but that image of the sun will be burned into my mind as long as I live. Another thing I won’t forget for a while: We got rave reviews. Everyone seemed to have a great experience, and we gave that to them! We started tearing the event down and gave away all of the posters that were hung up—the crowd seemed to love that! We picked up a whopping ½ bag of garbage after everyone left. There was a bee sting and somehow someone stepped on a nail, but other than that, no one got hurt and nothing caught on fire. The night was quiet, and no one was rowdy or caused a fuss. It was just a nice bunch of people. Thank you for granting us with the 734 solar viewing glasses. It meant a lot to people to have access to free and safe solar viewing, especially at a time when there were so many fakes going around. It was nice to say, “These came from SPS and they are absolutely safe.” As a community college we were proud to not to have to charge anyone for a fun and educational experience. We opened up the event and daily activities to our local community, asking for donations only, and were able to raise $530. There was also some money left over from the fees that were charged to overnight campers. There is talk of giving it back as a legacy item somehow. Some ideas are repairing our clock tower, building a larger sundial, making a time capsule, putting it into a scholarship, or building some sort of monument to remember the August 2017 eclipse. After the campers had a chance to explore the exhibits, the event was then opened to the public. Heavily advertised to the Rochester community by the museum, it was a huge hit, with an estimated 5,000 people in attendance in addition to the 180 campers. 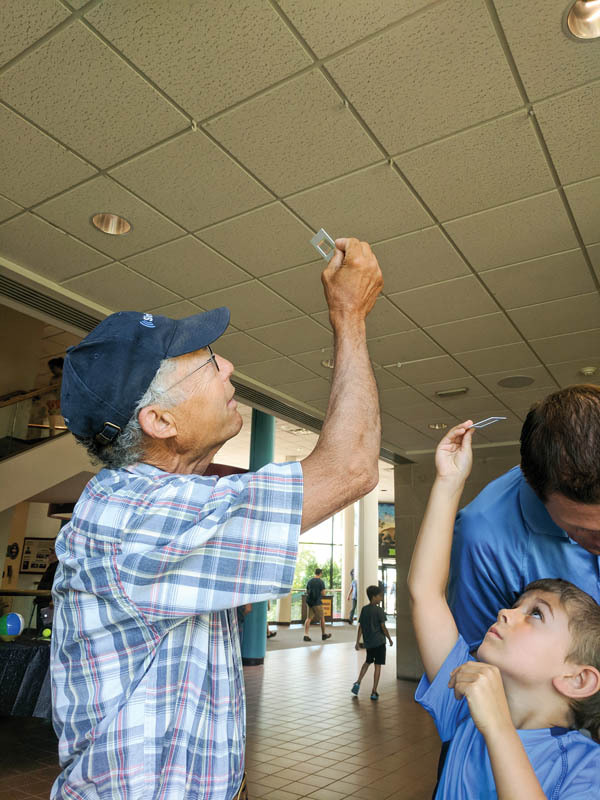 From 11:00 a.m. to 3:00 p.m., the public was given a chance to explore the museum exhibits for free, in honor of the occasion, as well as participate in our hands-on demonstrations. Because the semester had not yet started, we were limited in terms of the number of volunteers, but we were able to compensate with our enthusiasm! Our four volunteers on the day of the event were able to successfully carry out a variety of hands-on demonstrations that helped participants explore the nature of light and why we should care. One of our more popular demonstrations involved spectroscopy. We set up gas spectrum tubes for hydrogen, helium, and neon and handed out diffraction gratings so the participants could view the emission spectra of the elements, as well as white light. Our volunteers explained why each element has a different spectrum, and encouraged the participants to think about how it allows astronomers to determine what makes up far-away bodies. This was a huge hit with both the campers in the morning and the general public later in the day, as many had never seen an emission spectrum before. Participants also had fun making giant bubbles to observe their rainbow colors while volunteers explained this phenomenon, introducing the concept of light behaving as a wave and the resulting interference. They were also able to get a visual explanation as to why the sky is blue during the day and reddish at sunset by observing a glass tank filled with water and condensed milk. A volunteer explained Rayleigh scattering and shined a flashlight through the tank, encouraging participants to observe any differences in color in the tank based on the different positions of their head with respect to the flashlight. Our most popular activity was, by far, making pinhole projectors out of index cards and popsicle sticks. While we were able to give campers solar eclipse glasses to use to observe the 70 percent totality, we also encouraged them to make the projectors so they could compare their observations. 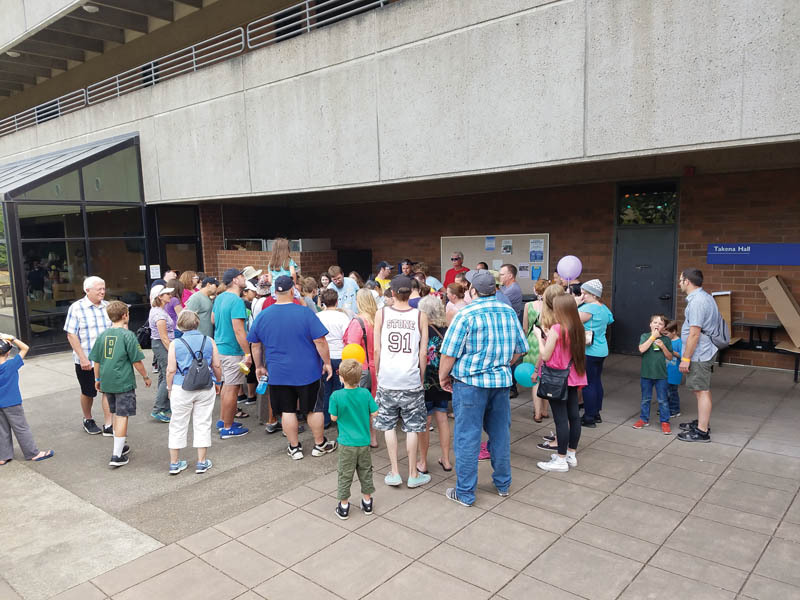 The activity was also a big hit with the general public, who we were not able to supply with eclipse glasses, as many of them did not have an alternative viewing option. 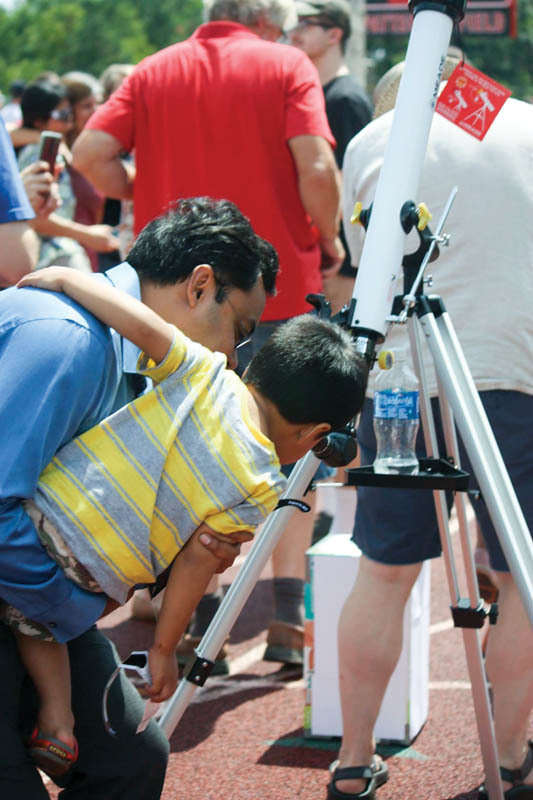 In addition to the demonstrations and activities offered by our chapter, the museum had various viewing stations for the eclipse, including a showing of the NASA live stream as well as telescopes with solar filters set up outdoors. The planetarium in the museum invited the local astronomy club to talk to the public about what they were observing. The museum also had exhibits showcasing the science of Earth’s atmosphere, climate change, and the solar system. Overall, we received a lot of positive feedback from campers and the general public alike; our collaboration with the RMSC and the grant from SPS allowed us to participate in creating a memorable eclipse viewing experience for 180 campers and about 5,000 members of the general public. More than that, we were able to create excitement for learning about the physics we observe every day, and prepare everyone for the total solar eclipse in 2024 when Rochester will be in the path of totality. The Physics Department knew how to capture images of the sun. With educational images, captions, and labels. At a viewing party hosted by a college trustee. To see the weather gradually become less ick. “To the bottom of the hill! to the football field turf! Soon reaching their destination where they got in a groove. it was an eclipse composition. Only a few more moments until the sun would appear gone. Until the announcement of “Glasses on” for we’d again see the sun’s shape. And our supplies were not equipped to stay out in it. The Total Solar Eclipse of 2017 was something we’d not forget. 9. Approximately 1,200 people attended the event.